Each week as we've been traveling through the US Civil War we've enjoyed learning about different leaders, Civil War vocabulary words, different battles, slavery, women of the Civil War and we've had some fun along the way. During our first week we made the recipe Hopping John, it was pretty good. I'm sure it's a shocker for some of you but I've never had black eyed peas before (gasp). Kylan and I liked it but Makenzie didn't care for it at all. If using dried black-eyed peas, soak overnight and drain in the morning. Bring a fresh 2 cups of water to a boil. Add peas, rice, salt, pepper, and drippings to the water. Return water to a boil, stir, and turn burner to simmer. Cover the pot with a lid and cook another 25-35 minutes or until all water is absorbed and rice is soft. Stir in crumbled bacon and serve. 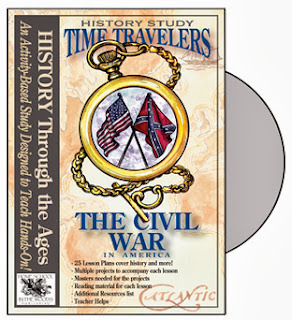 For those of you that are wondering about our choice of curriculum it's Time Travelers-The Civil War by Homeschool in the Woods. No, I'm not getting paid for this nor did I receive any items for free. I just love this so much that I want to share the info with all of you!